Gone are the days of plastic screen protectors, as are the days of the wet application screen protectors. Neither of those gave even a halfway decent touch experience and then along came tempered glass screen protectors and all was well… except when the display was a curved display. Herein lies the issue with the Pixel phones — the sides of the display are slightly curved. Some people do not use screen protectors, saying that the Gorilla Glass 4 (or whichever version is installed) is enough. For me though I have still seen many small scratches and scrapes on displays not protected to warrant me spending a few hard earned dollars to protect a display on a device that cost me a lot. My search for a decent tempered glass screen protector for the Pixel XL was a long one, and expensive (relatively). Most protectors up until recently just covered the visible display, often with a fraction of a millimetre poking out from the sides of the glass protector, and even then many had a “halo” around the edges where the curved nature of the display prevented it from sticking all the way to the edge. There was one display that was full screen but it lacked adhesive on the actual visible display and also had visible dots throughout the display. Just when I was all ready to have my Pixel XL go commando the intelliARMOR intelliGLASS Pro entered the fray. The intelliGLASS Pro differs from all the rest in that is covers the ENTIRE display and has a black border around it that approximates the bezel placement. It also offers crystal clear clarity when viewing the display without any obstructions such as a pattern etc that some do. It also has adhesive over the entire undersurface of it ensuring a close attachment to the device’s display. There is a couple of competitors that also have the black around the edges of the protector but some of them have no adhesive on the visible display and also have a strange dot pattern on the protector itself. The first, 5 tempered glass screen protectors I purchased fit terribly. I admit that 4 of them were from eBay and well under $10 each but one of them was over $40 from JB Hifi (Zagg). Each of them either did not cover the entire visible display or did but then had a “halo” around the sides of the protector. The intelliGLASS Pro fits amazingly well, even when it was put on by a certain radiographer with shaky hands in a room where the light source was positioned in a spot that made it difficult to see the edge. I showed a couple of friends at work today and both of them didn’t believe there was even a screen protector on it. The black borders fill virtually all the way to the edges of the front of the phone and it was only due to my poor positioning (around 0.5mm too low) that it was visible around the speaker and proximity sensor. Because of my poor positioning there appears to be a few pixels “cut off” at the top. Not a deal breaker of course but some users have complained about the sides cutting off a couple of pixels too. I feel that yes it does but doesn’t impact on your experience. The black is required to hide the bubble/halo effect from the curved display. The protectors oleophobic coating aids in the smoothness of it as well as minimising the amount of fingerprints on it. It feels as good as having the display naked. The touch sensitivity doesn’t feel to be affected by the protector at all. It feels as fast and sensitive as the day I got it. The display is crystal clear and there is no impairment of the display brightness at all. There is no decrease in the clarity or discolouration and while the border of the display is black rather than the veyr dark grey of the Pixel it does not look out of place. As I said friends I showed it to didn’t even realise there was a screen protector on it. It looks immaculate. While I installed it at work on a quiet day and did not perform it in a steamy bathroom as I usually recommend (to decrease the amount of dust etc in the air) it installed really well. There are two REALLY tiny flecks of dust under the display but are not visible while the display is on. My suggestion is to either have a torch (or headlamp) attached to your head to see the display better (black protector on black/dark grey device makes it difficult to demarcate the exact borders) or have someone shine a torch onto the display while you positon the protector. It installed easily as basically all tempered glass screen protectors do. Position the screen protector over the display, take off the backing of the protector while holding it over the position you are going to install it, double check the display is bereft of any dust etc place protector on phone in correct position. Carefully check position, adjust if required by carefully lifting off. Once you are satisfaied with the positon press down in the centre and watch it slowly adhere to the display. Use your fingers to smooth out any bubbles. If there are any bubbles near the edge give them a day or say and if still present hold it down for a good couple of minutes. Often we get review products given to us here at Ausdroid but there are times when we fork out our own money for a product and then decide to share our own experience with you, our readers. This is one of those times. I purchased two of these from the intelliARMOR website for a tick under US$20 and US$8 shipping. The trick to getting them this cheap is the discount code. They are out there to be found and while when asked intelliARMOR did give me a 10% discount code for you guys ( intelli10 ) larger discount codes can be found if you search certain sites. Was it worth it? Hell yes. I have a $1400 phone, so to spend AU$15 to protect the display is chump change. Keep your phone display immaculate and protected for a fraction of the cost of the phone. Tempered glass protectors are also meant to protect the display in the event of a drop (although this has not been my experience). I spent well over that amount continuing buying sub-par products off eBay. On top of all that there is a lifetime warranty on the intelliGLASS Pro if purchased from intelliARMOR or an authorised re-seller. In my experience, and from what I have seen on XDA, the company is very responsive to all queries and happy to help and offer assistance or make things right if something goes wrong. At this stage only the white version of the Pixel XL intelliGLASS Pro is available. The black is expected back in stock very soon (but be warned they sell out very quickly). The Pixel versions of the intelliGLASS Pro are expected to be “available roughly by next month”. Niether I nor Ausdroid have received any discount or payment for this review. Our reviews cannot be bought and always maintain independent ownership of our opinions. I paid the full fee (after the XDA discount) for these tempered glass screen protectors and would do it all over again if required! 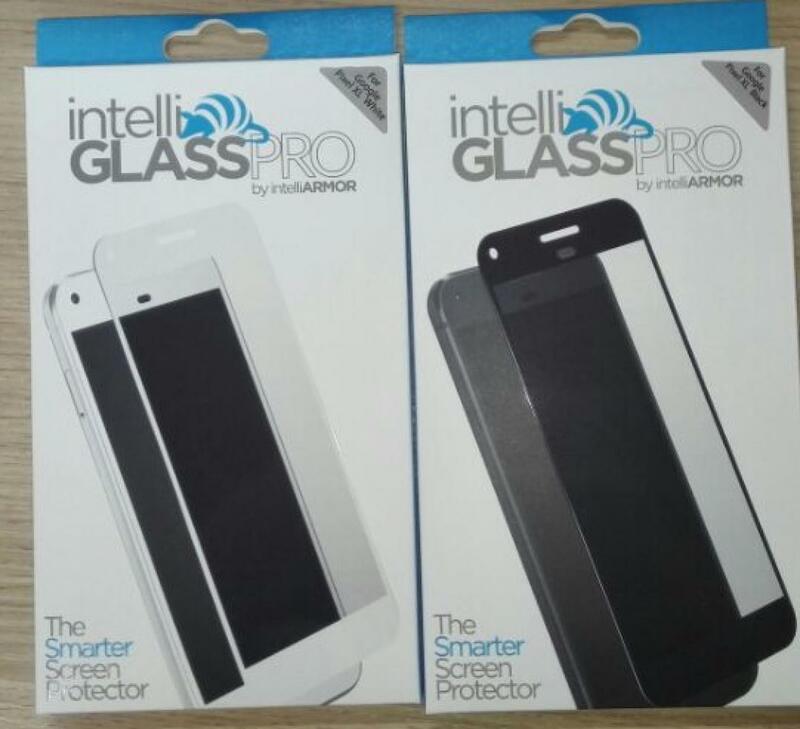 I cannot recommend the intelliARMOR intelliGLASS Pro highly enough and it you want a high quality for your Pixel (coming soon) or Pixel XL I strongly suggest you head over to the intelliARMOR website and check them out. One important saying that often holds weight across in this world is extremely fitting here: you get what you pay for. Thanks for the review! Just ordered a couple for my Pixel 5″. I’ve been using RhinoShield so far since I got the phone. Even though it doesn’t cover the entire front panel, it is the only solution without the halo effect or dot matrix/reflective surface that obstructs the display. This intelliglass pro seems to be best screen protector solution there is for Pixel. Can’t wait. Are these easy to remove if damaged? There’s no sticky residue left? Thanks Scott – I experienced the similar issue where my ebay glass protector didn’t cover to the edges of my Pixel XL screen. I bought some plastic protectors to see if they cover the edges but I haven’t tested them yet. If they don’t work I’ll be taking a look at the intelliGLASS Pro. The reason is as you said it yourself – “All it does is stop the original screen from getting scratches.” Yup, so you replace the protector at minimal cost once scratched instead of having your screen permanently scratched (or paying hundreds to have the screen replaced). How does it go with a case? One of the main reasons often cited for protectors that don’t go all the way to the edge is that they need to allow for a case to fit around the edge of the phone – and having tempered glass touching the inside edge of the case actually drastically reduces the strength of the glass (not to mention may make the case impossible to fit).